Vusi Thembekwayo is a South African entrepreneur and motivational speaker best known as one of the "Dragons" - a group of investors who offer ordinary South Africans investment in their businesses - in the Mzansi Magic reality show Dragons' Den. The rise of Benoni-born Thembekwayo as one of South Africa's top business speakers, advisor to CEOs and scale-entrepreneurs has been meteoric. Before turning 30 he had sold a portion of his advisory and private equity firm to the global investment bank Watermark Capital Llc. Today he is the CEO of Watermark Pan-African Capital Ltd which holds interests in East and West Africa. Through his investments he holds directorships that give him influence of over R4,32-billion in capital. 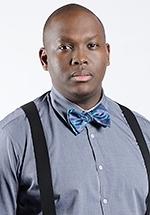 Vusi was the youngest director on a JSE listed company (he was appointed as a non-executive director of listed property developer RBA Holdings in 2013). In 2013 he was invited to speak at the World Bank and in 2014 he qualified (through dollar earnings) to join the National Speakers Association in New York.